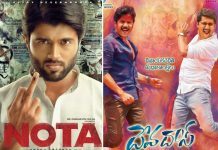 King Nagarjuna and Natural Star Nani are all set to entertain the audience with a comic entertainer DevaDas. Sriram Aditya is the director and the first teaser of the film has been out today. Nag and Nani share a great comic timing on screen. The teaser promises a joyful ride and Nag, Nani have been enjoying their drinks. Before Nag offers soda, Nani drinks raw. Nani’s expressions have been top notch. The soothing background score and Nag spotting Nani drinking are the highlights of the teaser. The teaser reveals that the film is full of light hearted comedy and will leave the audience thoroughly entertaining. Aakanksha Singh and Rashmika Mandanna are the female leads and Vyjayanthi Movies is producing DevaDas. 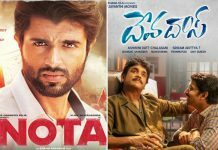 Nag plays a don in DevaDas while Nani plays the role of a doctor. The film has been slated for September 27th release.